We’ve all been there. A process works well in the laboratory, yet issues arise during scale-up to production size. Thanks to seamless vacuum technology from Vacuubrand, this may very well be a problem of the past. 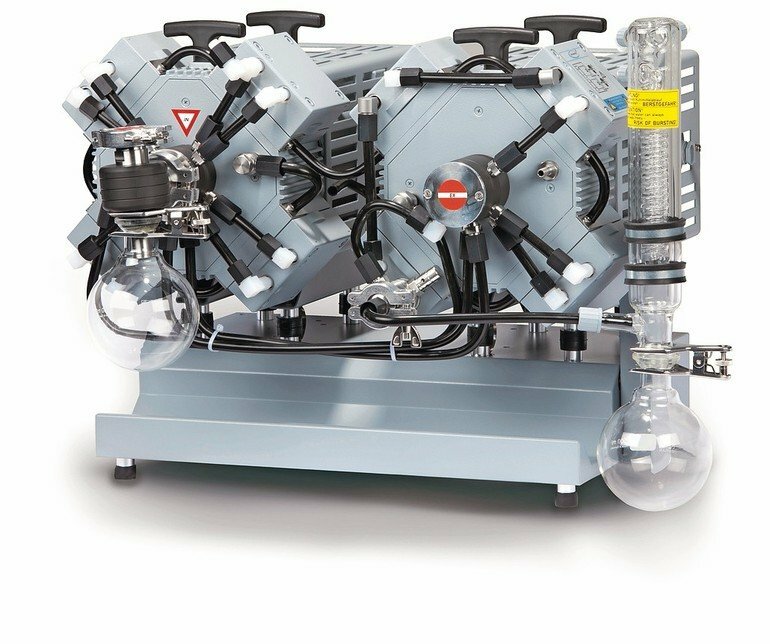 Individual pumps and modular vacuum systems with pumping speeds up to 120 m3/h allow a stable scale-up process. 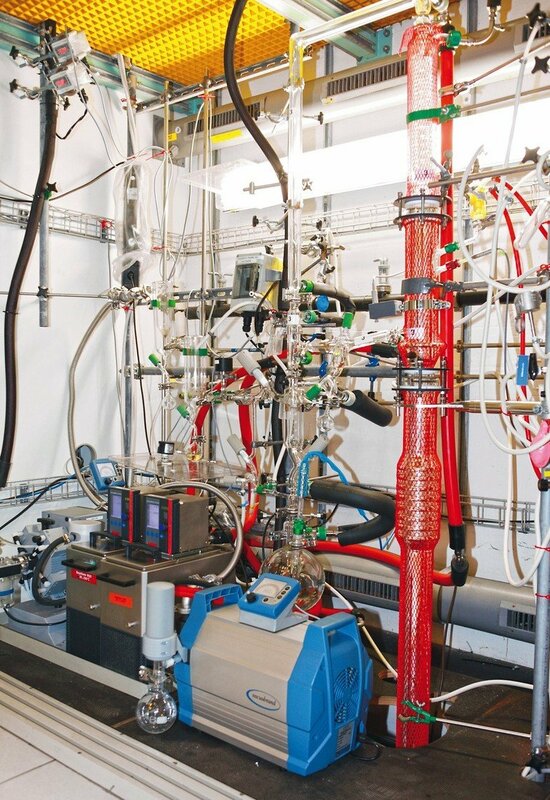 Mini and pilot plants in the chemical industry are at the interface between lab and production scale. Numerous chemical processes such as distillation, evaporation, drying, extraction or filtration are performed under vacuum. 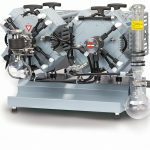 During scale-up, the vacuum technology has to be adapted accordingly – ideally without sacrificing proven advantages from the laboratory like chemical resistance, oil-free vacuum, durability or precise vacuum control. On the laboratory scale, chemical resistant diaphragm pumps are established as the go-to technology for the aforementioned applications. A lot of processes are operated at pressures between 1 and 500 mbar, falling well into the working range of diaphragm pumps. Mini and pilot plants usually require significantly higher pumping speeds than laboratory scale applications, often between 15 and 100 m3/h. The other requirements mostly remain unchanged. So, why switch technologies when something tried-and-tested is available? Apart from the obvious parameters like pumping speed and ultimate pressure, other factors need to be considered in order to achieve the optimum layout for a vacuum supply in the chemical industry, for example chemical resistance, the use of utilities, energy and maintenance costs. Taken together, in the long run they affect process reliability, availability and the total cost of ownership. 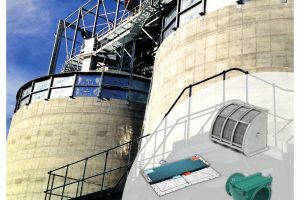 Appropriate measuring and control devices, which must be designed to be as chemically resistant and as robust as possible, are necessary to monitor and control the process vacuum. Many of the solvents commonly used in chemical plants are flammable at atmospheric pressure and have high vapour pressures, making them prone to forming explosive mixtures with air. In these cases, explosion protection, too, becomes an important factor. 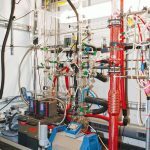 In chemical processes, not only air and water vapour are pumped but usually also aggressive vapours, so that vacuum pumps with high chemical resistance are a must. Due to the systematic use of fluoropolymers in all wetted areas, chemistry diaphragm pumps meet this requirement perfectly. Furthermore, these pumps are exceptionally tolerant of condensate. Vacuubrand manufactures all heavy-duty components such as head covers and diaphragm clamping discs with stable metal cores combined with a thick, diffusion-tight overmould. The proven PTFE sandwich design of these diaphragms guarantees high durability and long service intervals. 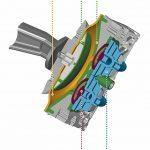 Depending on the application, the diaphragms typically only need to be replaced after 15,000 operating hours. Many processes and laboratories must be kept oil-free to avoid contamination of the products – another strong argument in favour of chemistry diaphragm pumps. They are dry-running and require neither operating nor cooling fluids, and they also operate completely oil-free without any abrasion. This guarantees a dry, clean vacuum and at the same time reduces operating costs, since no consumption or disposal of consumables occurs. For protection against particles and condensate droplets, chemistry diaphragm vacuum pumps can be equipped with an inlet catch pot. An emission condenser is used to re-condensate the vapours at the pump exhaust. Solvent recovery rates close to 100 % can be realised in this way, keeping both production sites and the environment clean. Rotary evaporation and many other processes require that the vacuum is controlled as precisely as possible. Speed-controlled diaphragm pumps like the Vario series achieve this precision automatically by adjusting the pump’s motor speed. This results in fewer strokes per minute, significantly reducing wear and tear and extending the service intervals accordingly. As a result, Vario pumps are nearly maintenance-free in many applications. Evapora-tion rates are maximised due to the hyste-resis-free pressure control when compared with conventional, two-point control using solenoid valves. Process times are consequently up to 30 % shorter. Energy consumption and thus operating costs can si-multaneously be reduced by up to 90 % depending on the process in question. 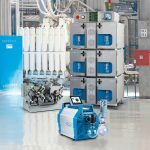 While precise vacuum control is paramount, user-friendliness and ease of use are becoming more and more important. 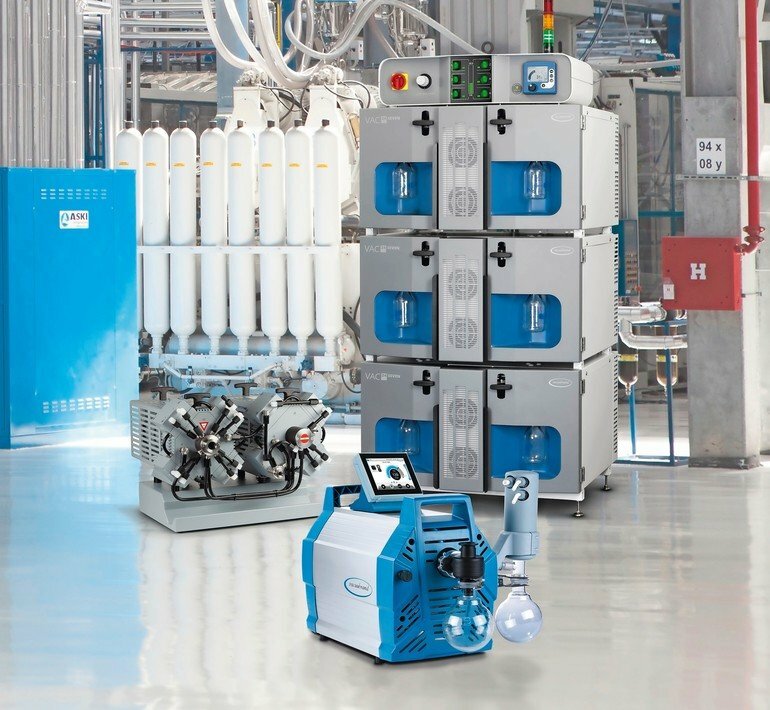 Vacuu-Select, the common controller on all Vario diaphragm pumps, sets a benchmark for straightforward and efficient operation: simply choose and start the desired application on a state-of-the-art touch display and let the controller execute the vacuum process all the way through. In case of solvent evaporation, Vacuu-Select automatically detects the boiling point and adapts the pressure continuously as necessary. Needless to say, the desired vacuum and other parameters are readily combinable in custom applications. Vacuubrand offers a comprehensive range of chemistry diaphragm pumps with Vario control. 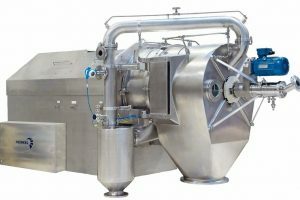 Typical applications such as rotary evaporation are covered along with supplies to local vacuum networks, kilo labs and mini plants. Even high boiling solvents can be easily evaporated at low temperatures using pumps with ultimate pressures of less than 1 mbar. Pumping speeds up to 30 m3/h are possible with large chemistry diaphragm pumps (maximum pumping speed: 20 m3/h) and Duo pumping units. In the latter case, the speed of two individual pumps is synchronously controlled and precisely adjusted to the vacuum requirement. For many applications – especially in mini or pilot plants – 100 % system uptime is essential. Any interruption due to maintenance, even when carried out at regular intervals, costs valuable process time. VAC 24seven, the modular process pump series providing pumping speeds of up to 120 m3/h, addresses this issue. 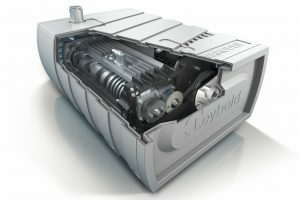 At the heart of every pump module are two variable speed pumps. Up to three pump modules can be combined with one control module. 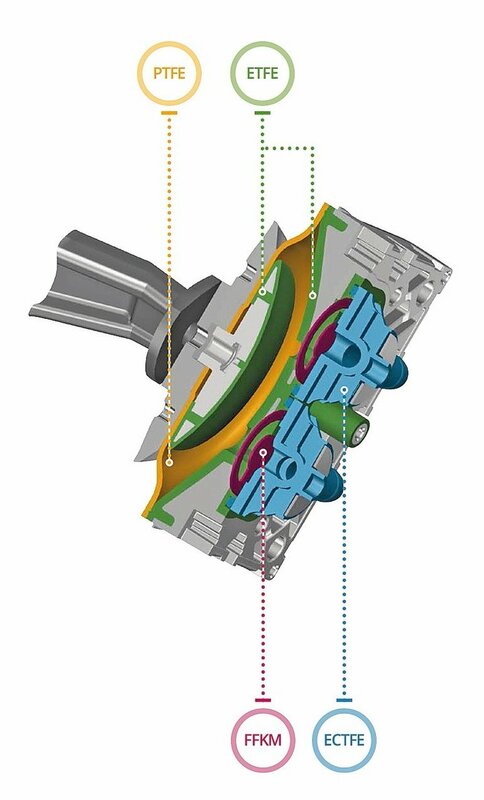 Individual pumps may be uncoupled for servicing, while the speed of the other pump(s) is automatically adjusted in order to maintain the correct process vacuum. This opens up totally new options for process technology. The pump modules are available in two different versions with an ultimate vacuum of 5 or 70 mbar. The control module provides synchronous vacuum control of the individual pumps, determines the required pumping speed and ensures an optimal process due to the demand-based speed control. Energy consumption is minimised and maintenance intervals extended. Almost all Vacuubrand diaphragm pumps and measuring instruments are approved for Atex category 3. If this category is not sufficient, chemical diaphragm pumps and pumping units conforming to Atex category 2 (e.g. for Zone 1) are also available. These pumps can be controlled in combination with the Vacuu-Select controller and corresponding system accessories, allowing fully automatic operation of the vacuum process without complex programming.